A 56-year-old man, accused of grabbing a 10-year-old boy and sniffing his arm, was sentenced to 32 months in prison Thursday after pleading guilty. 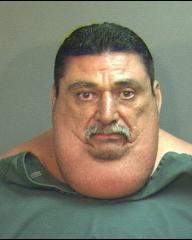 Victor Joseph Espinoza of Santa Ana, who weighs 425 pounds, pleaded guilty to a false imprisonment charge. His rap sheet includes a conviction as a gang member, according to CBS News. Headlines are meant to get your attention. This one clearly did. As for his size, I am sure you will agree that it is unfair for such a behemoth to assault a little kid.